Pat Fitzgerald coaches from the sideline. 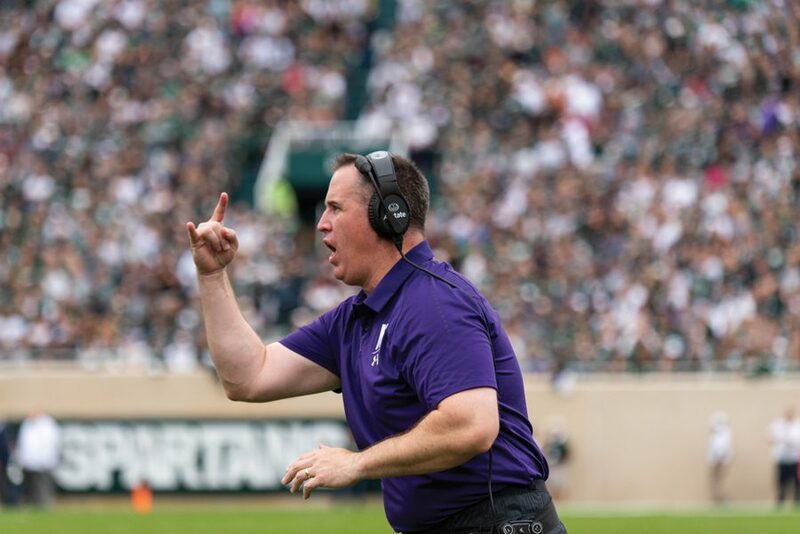 Pat Fitzgerald was named Big Ten Coach of the Year by both coaches and the media, the conference announced Tuesday. The distinction is the first for Fitzgerald in his 13 years at the helm of the Wildcats. He broke that streak this season by leading Northwestern to its first-ever Big Ten West title and a berth in Saturday’s conference title game against Ohio State. Fitzgerald, an All-American linebacker for the Cats in the 1990s, corralled his team from a sluggish 1-3 start to win seven straight Big Ten games and close the regular season 8-4. NU went 6-0 against west division foes and beat two ranked teams — Michigan State and Iowa — on the road. Speaking Monday, ahead of the announcement, Fitzgerald downplayed the significance of his individual accomplishments. The 43-year-old Fitzgerald is the first NU coach to receive the distinction since Randy Walker in 2000, when the Cats also finished the regular season 8-4. The award is the fifth total for NU since it was first introduced in 1972.